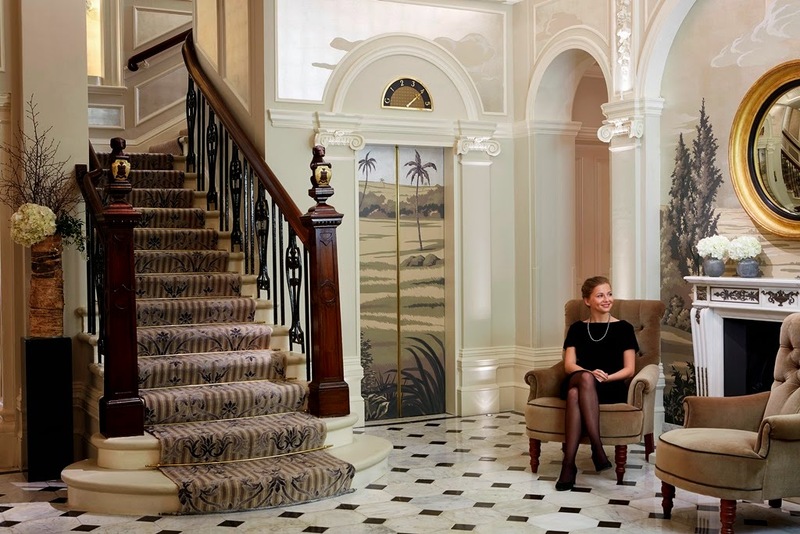 Although I have never been a guest at The Goring Hotel in London, I have long been familiar with it. 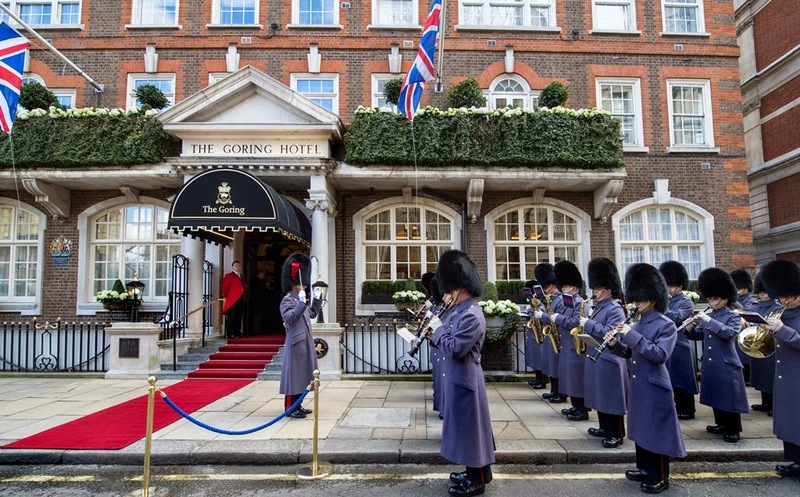 The hotel, which recently celebrated its 105th anniversary, has endeared itself to generations of well-heeled guests, including the Duchess of Cambridge, who, as you might recall, spent the night before her wedding at The Goring. 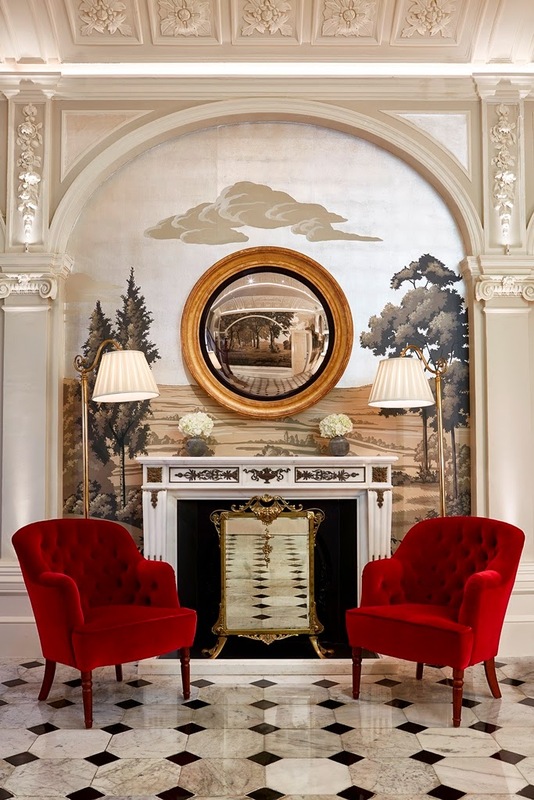 Just a few days ago, I read that the hotel had reopened after a major refurbishment, but I did not know until yesterday that Fromental, whose hand-painted wallpapers send me into reveries, was responsible for the magnificent scenic paper in the hotel's Front Hall, which was decorated by Russell Sage. At first glance, the paper impresses with its hand-gilded silver leaf background, its dense coloration, and its idyllic scenery. But look closely at the photos below, and you'll see all kinds of charming creatures, including flamingos, lions, and horses. 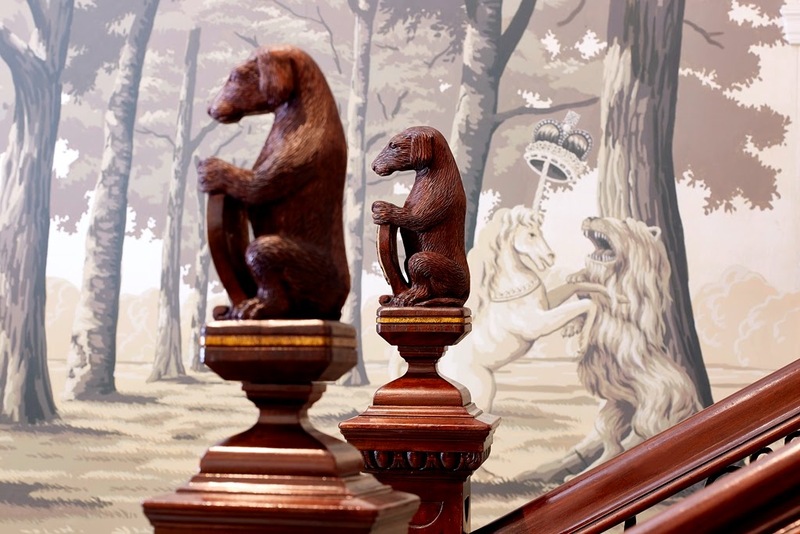 According to a recent Fromental press release, the paper depicts anthropomorphized animals, some of whom represent members of the Goring family. 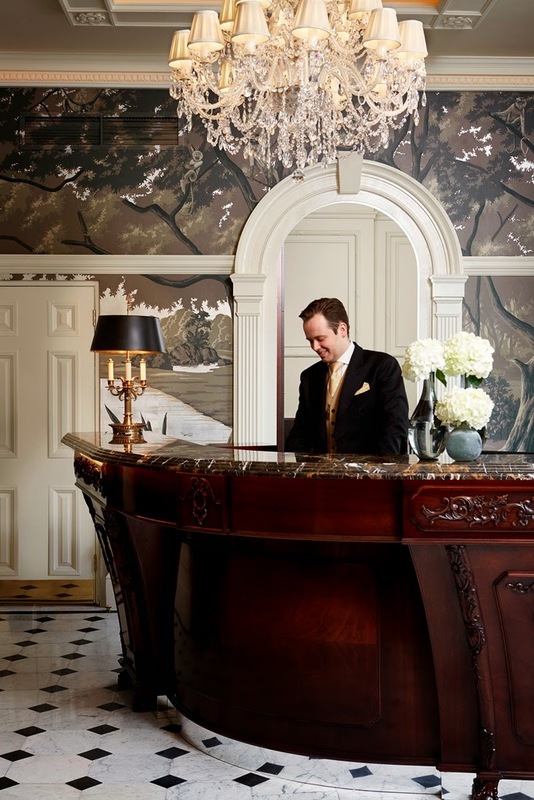 The founder of the hotel, Otto Richard Goring, is seen as a "bejeweled walrus", as is his son, Otto Gustave. The family's pet pigs are doing their military duty in the Battle of Trafalgar, while Managing Director David Morgan-Hewitt, who has a law degree, is depicted as a gorilla in a judge's wig. Is it any wonder that it took four artists eight weeks to paint these scenes? 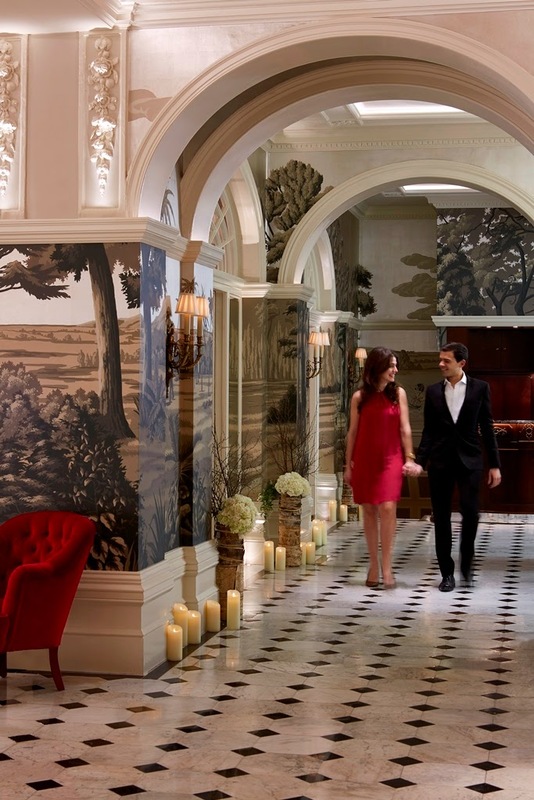 Like The Goring, Fromental also recently marked an anniversary: its tenth, which is yet another reason to celebrate. Based on the photos below, I'd say that both the hotel and Fromental can look forward to many more anniversaries. But back to that wallpaper by which I am so captivated. 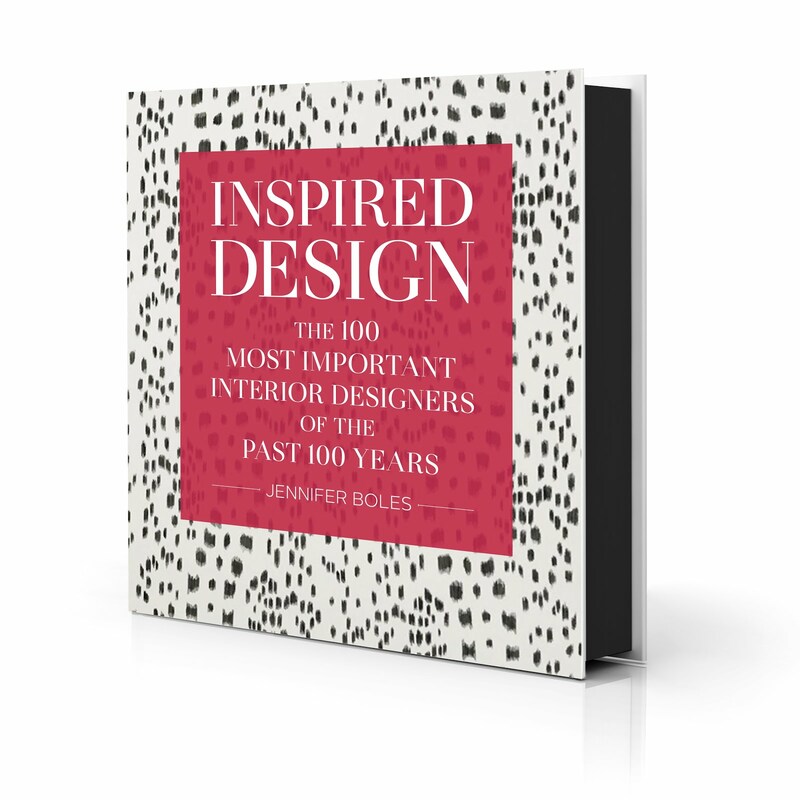 It has sparked my imagination, and I have thought about how Alfie and I might be depicted should I ever engage Fromental to paint a similar paper for me. I don't see Alfie engaged in battle, because he is too much of a whimp for that. For a dog who seems unabashedly drawn to the finer things in life, he needs a luxurious scene. I can see it now: Alfie painted as a maharaja in resplendent attire with his minions waiting on him hand and foot. Actually, that scene isn't so far from the truth. 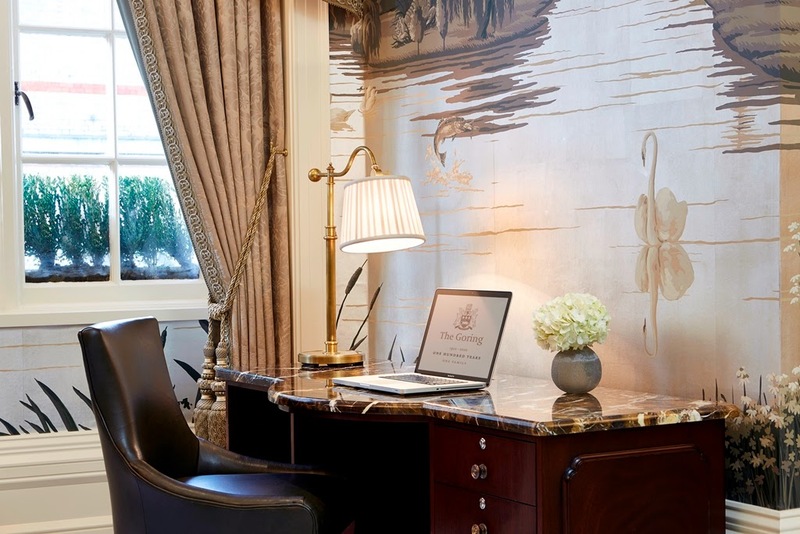 All photos courtesy of Fromental and The Goring Hotel. 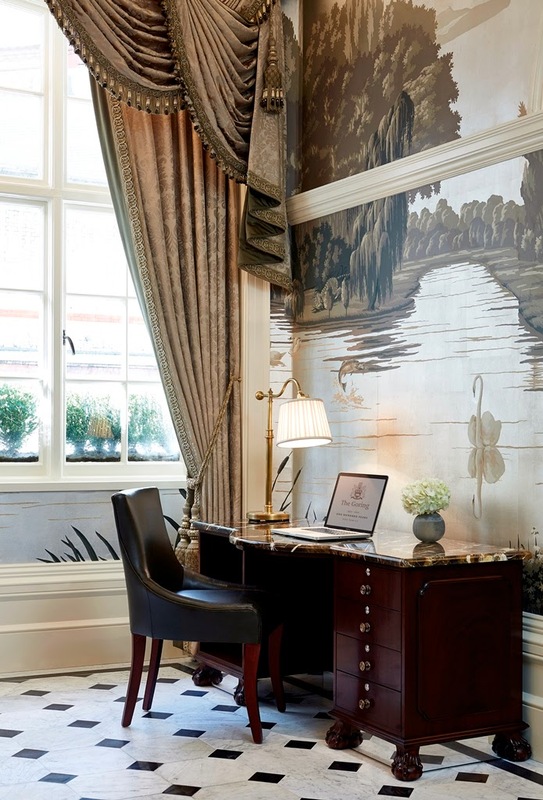 Jennifer the Fromental wall coverings at the Goring is stunning. Glorious works of art and of course I would be thrilled to stay there! Karena, I would be thrilled to stay there, too. Peggy- Thank you and have a nice weekend! That front hall design epitomizes classic and tasteful style and elegance! Deb, So true. Now I'm anxious to see the rest of the hotel. Had tea there many, many years ago. This is gorgeous! So often when these lovely old hotels get a do-over, they end up looking like a W Hotel, which is such a travesty for a gorgeous old building. This is spectacular! Yes, a Cavalier as a Maharaja! They are all total sybarites. If there is one goose down pillow in a room, they will find it and sit on it. They are ALL about their own comfort. My Godfrey sleeps in a "den of down" every night on my bed - he sleeps between 4 down pillows, with his own boudoir pillow (with a very lovely case) behind his head, and often pulls my down bed jacket off the pillows and over him. Quite cozy! srb, Alfie also has his own boudoir pillow, which has a Porthault green clover case on it. Talk about spoiled! It’s a seriously retro dish, including lobster, prawns, hardboiled eggs and your favourite aspic; along with her favourite cocktail, the Gin and It. 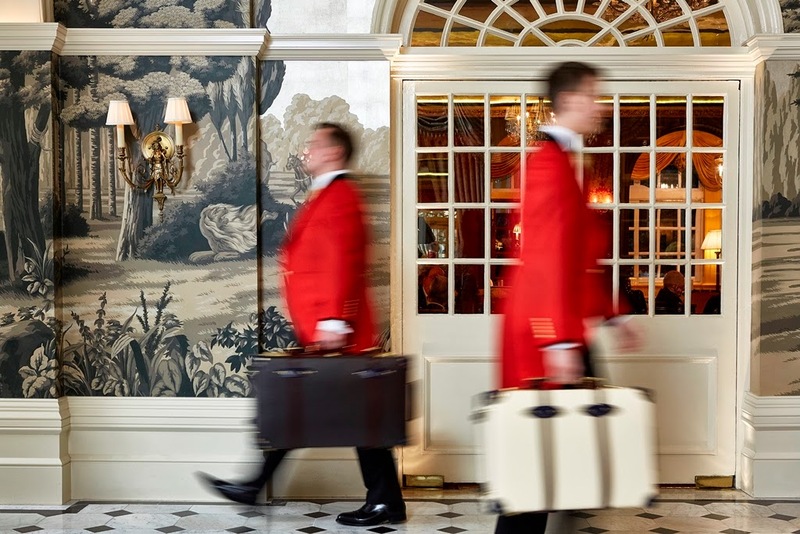 Now that Brown’s looks like a Los Angeles airport lounge, has The Goring stepped into the honourary shoes of the legendary hotel as featured in “At Bertram’s Hotel” ? Luke, Eggs Drumbilko sounds good to me. Remind me, what is in a Gin and It? "Gin and Italian” ie Gin and sweet red Italian Vermouth. Or Gin and Dubonnet. 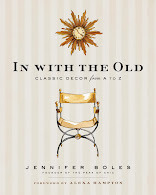 Loved old Goring, and after what happened to Brown's was afraid to look. Thanks for a great view. Lovely beyond! I will stay there the next time in London! Are these papers "hand-painted"; or hand-printed"? Completely beautiful! 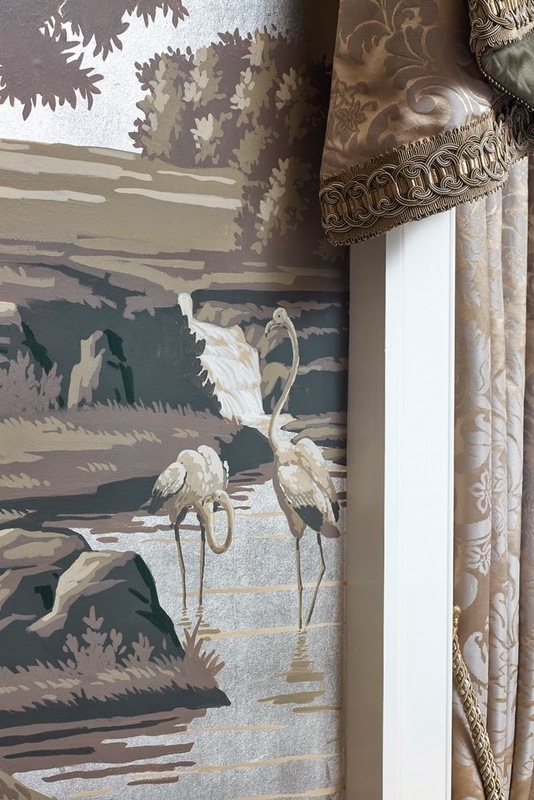 Fromental does an incredible job!